Elevate the average weekend brunch from ordinary to extraordinary with this Belgian waffle maker on hand. Thoughtfully designed by the Oster brand, the unit heats up quickly and offers user-friendly features that make it just as practical for healthy whole-wheat waffles served with slices of banana before work as it is for more decadent waffles-covered in strawberries and whipped cream or blueberries and warm maple syrup-on those leisurely weekend mornings with family and friends. Feel free to think beyond breakfast, too-Belgian waffles can be made with a variety of different ingredients to sweeten the deal, then served with ice cream, chocolate sauce, or other favorite toppings. The waffle maker's 1-1/2-inch surface creates extra-deep pockets and comes with a nonstick coating to help ensure effortless food release. Even more, its convenient flip system allows the batter to fully coat the cooking plates, which is important for evenly cooked waffles. To create light and fluffy waffles or waffles with a crispier texture, simply adjust the temperature. When finished, the drip tray removes easily for quick cleanup, and the appliance can be stored vertically to help save on counter or cabinet space. 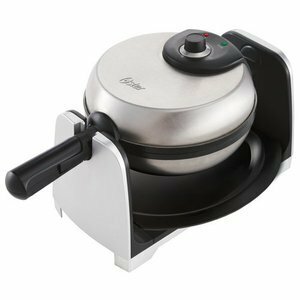 Attractively housed in brushed stainless steel, the Belgian waffle maker carries a one-year limited warranty.